One of the few times advertisements tell the truth. Ahh macys does sell everything. Where can I get condoms that cheap!?!?!?!?!? A--B--C--D--L--S--D, Gummi Bears are chasing me. First one's yellow, second one's blue. Third one's screaming I'LL KILL YOU!!!!! A--B--C--D--L--S--D, Gummi Bears are chasing me. Man, im bored . But i wanna get HIGH on the hilLSDale Ferris Wheel. 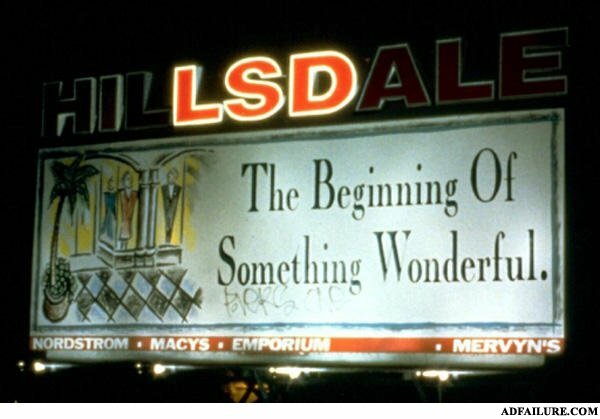 You don't need a billboard for LSD! This stuff sells itself!